How Do You Roll Sushi Bars is coming to the Shark Tank Show with a new franchise opportunity for the Sharks to take a bite out of. Yes we all know Sharks Love fresh fish but will they like the idea of building their own sushi with brothers Yuen and Peter Yung who own HDYR Sushi franchise? Yuen and Peter Yung started the "How Do You Roll Sushi" back in 2008 under the name MAKI when they seen a need for a better alternative to pre-made sushi that was anything but fresh and very limited on the selection. The sushi bars around Austin, Texas were also very expensive and require a Head Sushi Chef. Peter had already successfully achieved this level by the time he was 24 years old working in these same restaurants. The business idea was to offer a very large variety of unique ingredients to roll your own sushi and knowing it is as fresh as possible. For those that do not like to eat raw fish, the brothers also offer a variety of other healthy foods such as grilled chicken, beef, soy wraps and seasonal fruit's that make a balanced menu for any customer that walks in the door. You might also be the adventurous type and try their see weed salad or maybe the squid salad that has helped them get the reputation as "The most unique sushi bar that you will ever visit'. 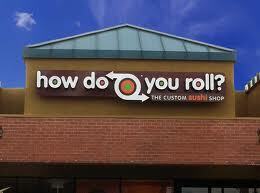 How Do You Roll first began franchising in 2010 and so far has a dozen casual fast food sushi bars so far in operation. Half of the restaurants are located in Texas while the other's are located in Arizona, California, North Carolina and Florida. Florida just opened up it's first HDYR restaurant last month to a franchise group called "SoFlo Sushi LLC" that plans for an additional two new restaurants within the next 18 months. The franchisee is Chris Barney who is no stranger to building out casual niche restaurants with high growth potential. To have someone of his stature backing the first HDYR restaurants in Florida is a major plus and certainly adds to the validity of expanding the Brand on a national, if not global level. So how will the Sharks react to this fishy deal? This is one set of negotiations that could get very expensive, very quick. The Yung's have done a great job in testing in various markets and they are now ready to expand in a major way. Product awareness is always a major struggle for any franchise advertising for new customers as well as potential investors and franchisees. Having 7+ million people learn about the HDYR Sushi Restaurant's and what they stand for will most definitely have a major impact on all the existing restaurants and bring in a flood of new franchisee interest. Is this the company that gets a million dollar offer from Kevin O'Leary? Looking into my "Shark Tank Crystal Ball" It looks very promising. This business may be a little out of the norm for O'Leary, but then again, maybe they are just looking for financing and not another business partner with an equity stake in the company. A million dollar loan and the Shark Tank Effect combined just might be what this company needs to become a National Brand that folks first heard about on the shark Tank Show. The Yung Brother's rolled into the Shark Tank asking a million dollars for a 12% stake in the sushi business. They have 40 total stores open at that time including the franchisees. Average bill is $10-$12 per person. Corporate royalties will exceed $250k per year in which they receive 7% on a weekly basis. My first impression when Peter was giving Barbara Corcoran a demonstration making Her Sushi Roll? Just like a Subway Sandwich Shop would be setup up to make your custom sandwich. My Sons first reaction was they need to do that making pizza, but that's another story. Kevin O'Leary does indeed offer Yuen and Peter $1 Million but he wants double the equity or 22% of the HDYR Sushi Business. Of course Kevin is not just going to give away a million dollars and hope to see a return on his investment some day, he wants the extra cash flow distributed on a monthly basis in which he will receive his share right off the top. They negotiate down to 20% with the same terms and make a million dollar deal with O'Leary. It looks like Sharks really do like sushi. Their sushi idea is immensely innovative. I hope they spread nationwide. How is the sushi business doing now? Is their partnership with Kevin successful? I have been to their location in Tucson. It's pretty good, and I've been back. I'm sure the franchise will be very successful, from what we've seen so far. This concept is not new. Fusian.com has been around for quite a while. But there is room for more than one. Look at Chipotle, Qdoba, and Moes Southwestern Grill. They are all the same. the funny thing is the Japanese obviously have been doing rolls for centuries but they take their food so seriously and stringently they have never tried an idea like this I think, even though it is quite obvious.